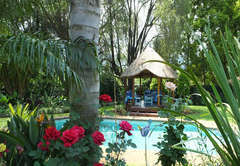 Dublin Guest Lodge is a highly recommended B&B with self catering option, providing accommodation in Sabie for tourists visiting the Panorama Route region. Sleeping ten guests and located in a leafy and colourful garden, two suites are located in the main house and a comfortable self-catering cottage is very private and separated from the main house at Dublin Guest Lodge. The Cottage has its own private entrance and secure, undercover parking and guests are welcome to make use of the sparkling swimming pool. 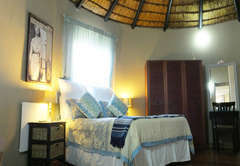 It is a thatched roof bedroom with a good quality Queen-size bed. 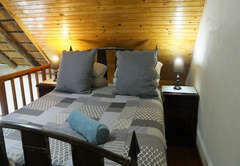 The cottage is equipped with a ceiling fan for the hot summer months and the room is equipped with a cupboard for clothing, a dresser with a mirror and hairdryer. 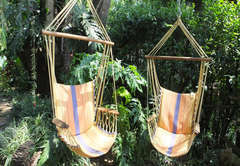 A camping cot can be provided. There is a shower, bath, basin and toilet in the bathroom. The unit has a wall mounted heater. The sleepers couches can sleep two additional guests. All linen and bathroom towels are provided. There is DStv in the lounge and a private patio with built-in braai. The kitchen, living and dining areas are open plan. The kitchen is fully equipped with a stove, fridge, microwave oven, kettle, toaster, pots and pans, cooking utensils, cutlery and crockery. We also provide place mats, table cloths, candles and paraffin lamps for load shedding or a romantic evening! Complimentary tea, coffee and biscuits are available daily. 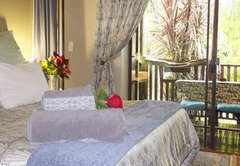 The two suites are furnished with a Queen size bed and have a full ensuite bathroom. 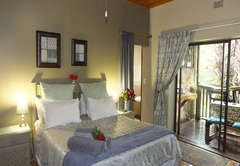 The rooms lead onto a wooden deck overlooking the mountains, garden and swimming pool. A fridge as well as complementary coffee and tea tray are provided. Both linen and bathroom towels are provided. Safe parking is available. Please note neither unit has a TV. Both units have wall mounted heaters. Carlow Suite is large enough to add an additional two single beds on request. 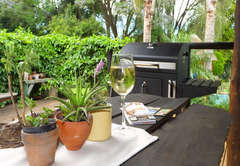 The units are fully equipped for self catering as each unit has its own braai / barbeque. Complimentary tea, coffee and biscuits are available daily. The Kerry Suite is an open-plan unit with a Queen size bed. 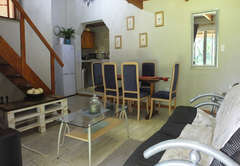 The unit has a fully equipped kitchen and the dining area seats four. An additional two people can be accommodated on a sleeper couch in the living room. The shared bathroom has a Jacuzzi shower, basin and toilet. 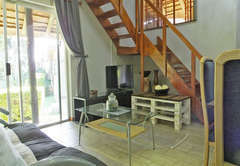 The unit leads onto a patio with a braai / barbeque and seating area overlooking the garden and swimming pool. Complimentary tea, coffee and biscuits are available daily. The cottage and suites get serviced every day. Dublin Guest Lodge offers a Continental or a full Buffet breakfast. 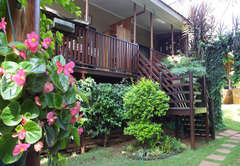 The cottage and suites are within walking distance to most amenities and the Sabie Falls. There are also other waterfalls in the area. 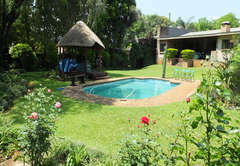 We are 50km from the world famous Kruger National Park, the closest gate is the Phabeni Gate. Double room with queen size bed, extra bed on request. Full en-suite bathroom. Room leads out onto a wooden deck that overlooks the mountains, garden & swimming pool. Room has a fridge & coffee & tea. Linen & bathroom towels are provided. One bedroom cottage with full en-suite bathroom. Large open-plan kitchen, living & dining room area with two sleeper couches. 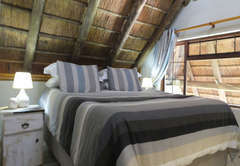 Can add two additional single beds.Private patio with braai (under-roof). Double room with queen size bed, extra bed on request (stretcher). Full en-suite bathroom. Room leads out onto a wooden deck that overlooks the mountains, garden & swimming pool. Room has a fridge & coffee & tea. Linen & bathroom towels are provided. Open-plan room with a queen size bed and two sleeper couches. Bathroom with shower, toilet & basin. 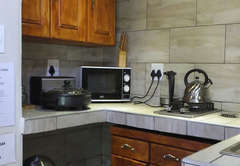 Fully equipped kitchen for self-catering. Patio with seating area and build in braai/barbeque. All linen & bathroom towels are provided. Double story, 3 bedroom and 2 Bathroom. 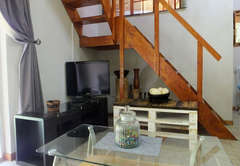 Fully equipped self catering unit with own private patio and braai area. Response timeDublin Guest Lodge typically responds to requests in 5-10 minutes.